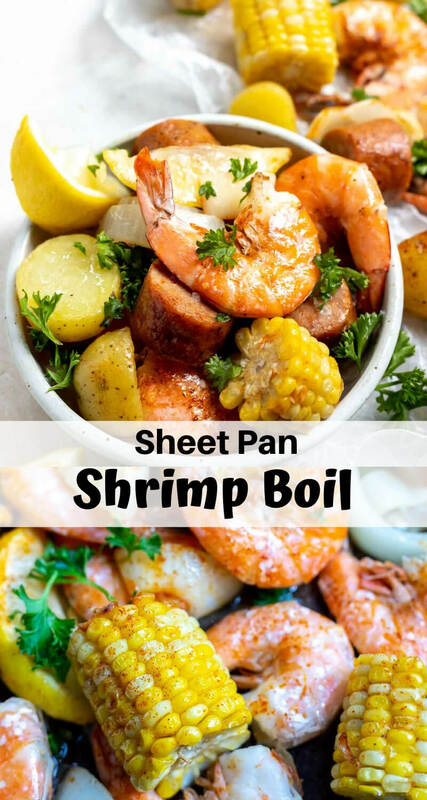 This Sheet Pan Shrimp Boil In Oven is a quick and easy way to enjoy a Low Country Shrimp Boil without all the fuss. 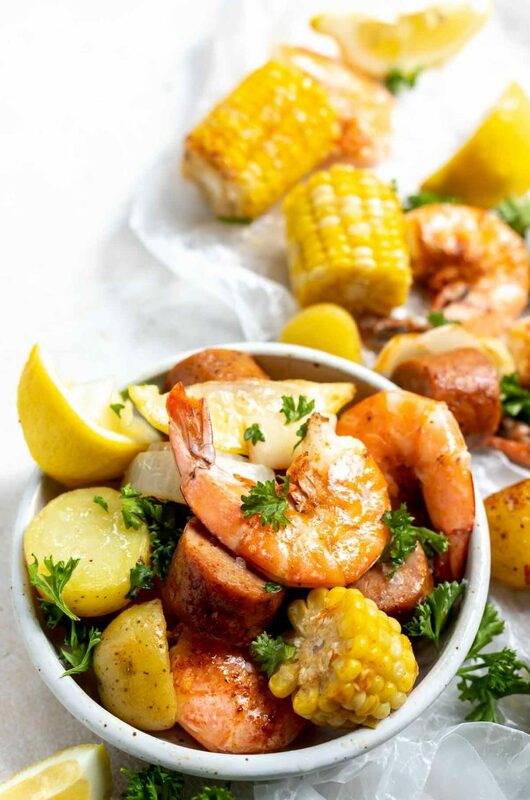 Fresh shrimp, corn on the cob, potatoes, onions and sausage makes a great family dinner recipe or party idea. 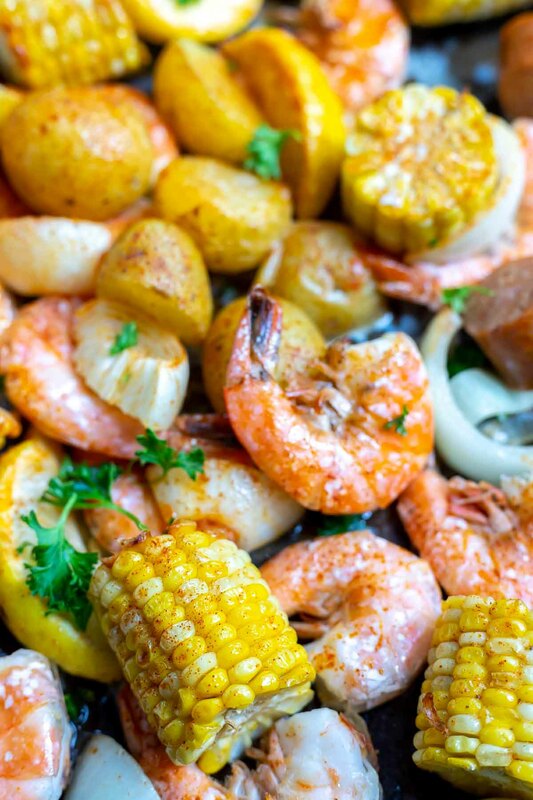 The best part about making this Sheet Pan Shrimp Boil is how simple it is. 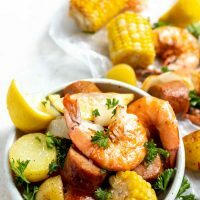 This Shrimp Boil Recipe is quick, easy and does not involve a lot of cleanup ← all requirements for my favorite family meals! 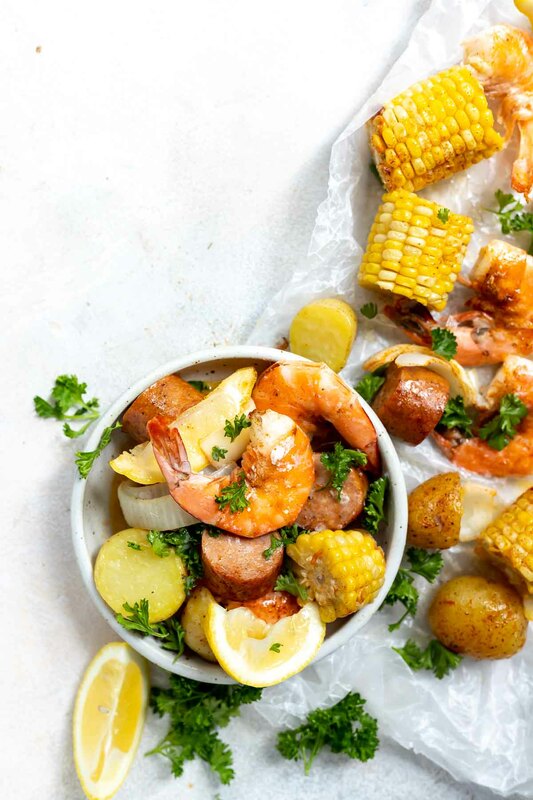 Plus, the kids will love to spread out this shrimp boil and chow down. During the cold months my daughter and I do an inside shrimp boil carpet picnic. In the warm months we enjoy this as an outside dinner. Toss all ingredients with melted butter spice mixture. Transfer to a greased, rimmed baking sheet. Bake at 400ºF until shrimp are fully cooked. Serve with extra melted butter, salt, hot sauce, fresh parsley and lemons. The outsides will be pink and the inside will be white (opaque). I usually test the largest shrimp by breaking it open and checking doneness in the middle. Cooking times vary depending on the size of the shrimp, so using your best judgement is necessary. Shrimp are one of those proteins that you do not want to under cook. Ideally you get them perfectly cooked. But honestly, I will always choose slightly overcooked over undercooked shrimp. Corn on the cob, potatoes and onions are cooked along with the shrimp. You can serve with crusty bread, rice, lots of lemons and extra melted butter for the ultimate feast. Bring a large pot of water to a boil. Add in potatoes and boil 7-10 minutes or until almost fork tender. Then add the corn and boil 3 minutes. Drain. In large bowl combine potatoes, corn, shrimp, sausage, 2 lemons and onion. Mix melted butter, oil, garlic and seasoning. Pour mixture over shrimp and other ingredients. Toss until evenly coated. Bake 8-10 minutes or until shrimp are almost cooked though. Broil on high 2-3 minutes until shrimp are pink on the outside and white/opaque on the inside. Serve with extra melted butter, fresh parsley, salt, lemons and crusty bread.